Date Joined November 26, 2005 Location out of my mind! Hi^^ I'm miaya I currently only have my trusty pencils paper and open canvas for supplies.I try to occasionally color pic but it doesn't normally work.please take a look at my gallery.Some of my favorite animes are eureka seven,higurashi no naku koro ni, naruto and bleach.I am currently learning how to speak Japanese.My favorite female character is chun li.My favorite male character is gaara who I absolutely love. This a better description of Teneka and it tells a part of her past. It's just a storie about my OC.Kisame x OC, Neji x Gaara, Lee x TenTen, Sasuke x Naruto, Shino x Hinata, Chouji x Ino, Shikamaru x Temari. thats pretty fun. and thanks for the comment . xD yes, L is awesome . so whats up ? nottin much just browseing the site,checking my mail. No prob. 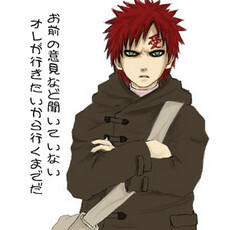 I love that pic of Gaara btw!